Every Star Wars fan has asked themselves if Earth exists in the Star Wars lore. Ace Books was ready to connect our home planet to the Galaxy Far Far Away with a trilogy called Alien Exodus, written by Robert J. Sawyer. Alien Exodus was going to be a story within a story, where a human slave on an insectoid alien-controlled planet finds a book that details the human journey from Earth to the Galaxy Far Far Away. The story goes that in the 25th century, the earth becomes a totalitarian dystopia controlled by a computer, so a bunch of refugees lead by Paxton Solo decide to escape and seek a better life elsewhere. As they reach deep space, a wormhole swallows their ship and sends them back in time and far far away to the Star Wars galaxy. They begin setting up a human civilization among the native races, starting with Corellia, named after Antonia Corelli, one of the prominent refugees who died at the hands of Rodian slavers. After after some millennia, humans become the dominant force in the galaxy. Kind of cool, isn’t it? 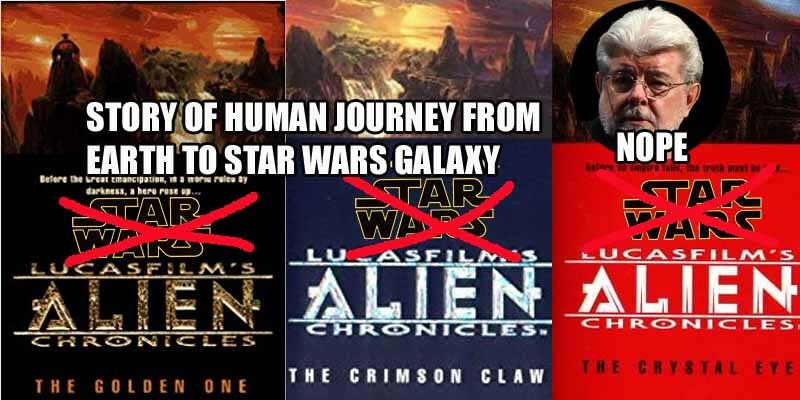 When the time came for official approval from LucasFilm, George Lucas made a very dumb decision – he wouldn’t let Ace Books use Star Wars alien species. You can’t really write a Star Wars book without Star Wars aliens, so Sawyer dropped out and the project was reassigned to Debora Chester, who had to rewrite the trilogy in a way that has nothing to do with Star Wars, although still under the LucasFilm banner.